I fell in love this week. No, not with a man -- though I'm not ruling out that possibility. No, this time I'm talking about my by Terry Baume de Rose. It's no secret that I love all things floral ... and especially all things rose. "A rose by any other name may smell as sweet." That phrase may work for some people, but for me? I don't think so. There's something so unbelievably, deliciously intoxicating about the scent of a blooming rose -- I've never found anything else quite like it. And by Terry Baume de Rose captures that scent perfectly. I like my lip balms to be creamy but not waxy -- and, of course, they have to soften my lips, or what's the point? by Terry Baume de Rose does all that and more -- and it lasts for hours, so reapplication is at a minimum. (Which is nice, since at $58 it's definitely on the pricey side for a lip balm.) It even has SPF 15, so my lips are protected against harmful UVA and UVB rays while looking fantastic. And while I know some gals may frown at the idea of a pot balm, how can you go wrong with a chic frosted pot with gleaming silver top? I really think you can't. While this balm can actually be used for both the lips and cuticles, so far I've just stuck to my lips. It leaves a gorgeous, shimmery sheen upon my pout that on its own is perfect for day, or fabulous for night when layered over a darker lip color. Not to mention its many amazing properties -- it rejuvenates, repairs, strengthens, nourishes and fights aging. This is due to a high concentration of lipid-building substances and essential rose wax. Created by the by Terry Research Laboratories, this balm really does promote an inner and outer glow. 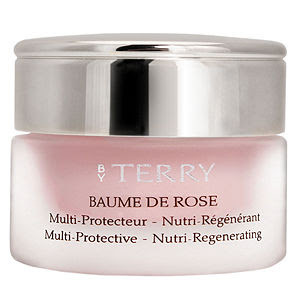 by Terry Baume de Rose retails for $59 at beauty.com. Darling, that price is rather steep for a lip balm and I do frown upon a potted one. Just imagine all those microbes happily multiplying. Still, the packaging is beautiful and the properties are quite curious. It's multi-purpose ... just like Smith's Rose Bud Salve. Why not use that? It can be used on diaper rashes, elbows, cuticles, lips, etc. ... at a fraction of the cost. But I do agree with you - the packaging is gorgeous and I also love floral scents. I think the Olsen twins use this too! I remember seeing a feature of what's in their makeup bag in a magazine a while ago.